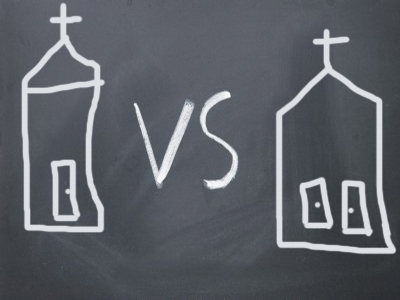 If your church wants to be better, maybe it should start competing with other churches. Judging from the reactions I get from some church people after I say that, you’d think I’d suggested adding Justin Bieber to the Holy Trinity. Some of us have become afraid of the word competition. We think the concept is worldly, even evil. But competition doesn’t need to be a bad thing. At its best, competition can make everyone stronger. In the church world, fear of competition comes largely from a misconception commonly heard in economics discussions. Some of us think that the number of potential church members in a community make up a pie, and that the size of that pie is fixed. Each church gets a piece of that pie, and the only way to get a bigger piece is to take pie from the other churches. This simply isn’t so. Here’s why. In the business world, if a product has reached market saturation, then the pie analogy starts to have some validity. Theoretically, once there are no new customers for a particular type of product, competing vendors are forced to go after each other’s customers to increase their market share. But Christianity is nowhere near market saturation, so churches don’t need to compete for the same people. The reality, of course, is that a congregation that is effective at attracting the unchurched is also going to occasionally steal a few sheep from the church down the street. This is normal, and it need not be taken personally. There’s a big difference between directly targeting another church’s members and attracting them while trying to reach a different group. Remember, people in the pews often have the same hang-ups about church as the ones who aren’t already part of a congregation — they just haven’t figured out how to escape yet. There’s no way to attract one group without appealing to the other. So what’s the point of competing if it isn’t to destroy the competition? Well, for one, to raise the bar and improve everyone’s game. Competition can be friendly. Consider one-on-one basketball. Although you want to win every time you play, if you have half a brain you also want your friend’s game to improve as well. Why? Because that pushes you to continue raise the level of your game. Playing against scrubs is good for your ego, but it won’t make you a better basketball player. Remember, as iron sharpens iron, so one person sharpens another (Proverbs 27:17). Congregations sharpen each other too. As long as there aren’t any serious alternatives to your church, you can get away with sparse ministry offerings, mediocre sermons and subpar music — for a season. But when NewChurchPlant.tv comes to town with top notch everything, sooner or later it’s going to hit you that the playing field has changed. Actually it was changing all along — the competing church just made it obvious. There are at least a couple of strategies churches can use as they pursue friendly competition with other congregations. One is the “do it better than the other church” strategy. If the other church’s pastor has great sermons, your sermons will be masterpieces. If their band is really good, yours will be better, and so on. Another strategy is to do what the other church isn’t doing. No congregation can be all things to all people. No matter how successful a church is at reaching the masses, there are always going to be opportunities for other congregations to reach different souls. Some people don’t like rock worship bands. Others don’t like lectionary preaching. Some don’t care for small groups. Others aren’t keen on Sunday School. Every church with strengths also has a few weaknesses. You can capitalize on those weaknesses by making them your church’s strengths. In this passage the Christian life is compared to and contrasted with an actual footrace. Our prize is not temporary, it’s eternal. And it’s not finite, it’s infinite. The paradox is, although there’s more than enough of a crown to go around, we’re still supposed to run to win. And since we’re all in the same race, we’re competing with each other, even though we’re ultimately on the same team. Perhaps God is pleased when we try to outdo one another — but in a holy way. Church is like that too — we’re all working together for the same kingdom, but we’re doing it in competition so we can push the entire body of Christ toward excellence.